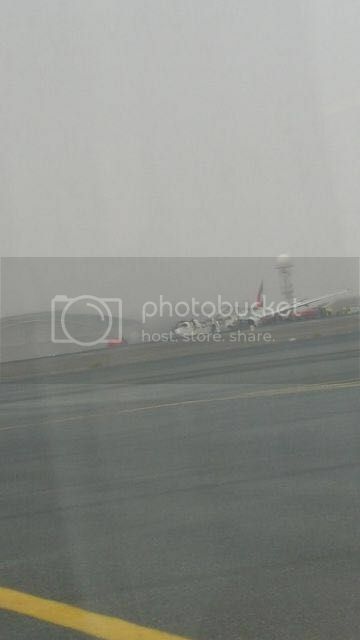 All the flight operations in and out of Dxb Intl Airport has been suspended. Thank you for sharing. I never knew about this. PIA, Emirates, Etihad, Qatar, Lufthansa, BA, Turkish, American, AirBerlin, Thai, Air France, Delta, Korean, Qantas, and many more. PIA flight Islamabad to Dubai Pk211 diverted to KHI. "According to ATC recordings the aircraft performed a normal approach and landing, there was no priority or emergency declared. Upon contacting tower tower reminded the crew of lowering the gear and cleared the aircraft to land. Another approach reported on tower frequency. About 2 minutes after EK-521 reported on tower, the crew reported going around, tower instructed the aircraft to climb to 4000 feet, the crew acknowledged climbing to 4000 feet, a few seconds later tower instructs the next arrival to go around and alerts emergency services. The position of the aircraft is described near the end of the runway." I am supposed to fly to Dubai tonight. I expect delays! No message from Qantas yet. How is it possible that a 777 approaches for a landing and there is no warning in the cockpit for landing gear and even after that pilots continue for landing. Strange! As per Khaleej times, 10 injuries reported out of 278 pax and 18 crew members. Aircraft is badly damaged but fortunately all souls on board remains safe Alhumdulillah. Flying operations still disturbed and no confirm time given so far. Abdulrafeysiddiqui wrote: How is it possible that a 777 approaches for a landing and there is no warning in the cockpit for landing gear and even after that pilots continue for landing. Strange! So far UAE media handle this matter very professionally and they are releasing the statements step by step. There will be surely series of incidents which cause this serious damage. Waiting for more updates. One fire fighter died during rescue operations. All pax on board remained safe. Four passengers received minor injuries and were treated at the airport. One firefighter died and ten pessengers injured. Aircraft was quiet old B 777 300 with animal class 3 4 3 abreast configuration. Can any one please confirm that why Emirates operates old aircrafts on South Asian routs except Mumbai? To me it looks Pakistani local bus, nicely decorated but always over loaded. PK_Japan wrote: One firefighter died and ten pessengers injured. Aircraft was quiet old B 777 300 with animal class 3 4 3 abreast configuration. Can any one please confirm that why Emirates operates old aircrafts on South Asian routs except Mumbai? There is no such discrimination. However, generaly B773 with trent engines are employed on shorter sectors i.e middle east, subcontinent and eastern europe. I have my flown to Pakistan on few occassions where the aircraft was just a week old and in one case on its first revenue flight. To me it looks Pakistani local bus, nicely decorated but always over loaded. The plane was 1/3 of its capacity. Regardless of the age, the cabin and exteriors get a rgular makeover and upgrade and in most cases one cant tell this is an 'older' plane. Some Facebook page claims there is at least one pax who couldn't sustain the injuries and now died. He is an Emrati. Remember Emitates can't compare with PiA because it is just like oil company's airline and PIA is an airline of a hundered times bigger country. It is in bad times now but it will grow again soon inshallah. That means Aircarft was 13 years old with makeup done like Niazi HInobBus service or New Khan coach service. And about discrimination, I have seen with my eyes cabin crew behaviour toward fellow pessangers. Just because they were wearing national dress not a modern one, it is same with other ME airlines. Last edited by PK_Japan on Thu Aug 04, 2016 5:32 pm, edited 3 times in total.